The Privacy settings for Silk help you to stay safe when you’re browsing online. Browsing out there on the Internet can be a bit dangerous. There are people and businesses who want to leave small files on your computer called cookies that they use to track your activities or gain illegal access to your online accounts. Some uses of cookies are perfectly legitimate and allow a reputable business such as Amazon to greet you with personalized recommendations based on your past activities when you visit their sites. Less reputable sites sell your information to others or advertise based on your online history by displaying irritating pop-up windows. With Silk open, tap the Menu button on the Options bar, and then tap Settings to view and modify the following privacy settings. 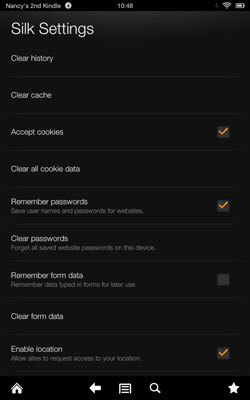 Accept Cookies: Tap this check box to stop sites from downloading cookies to your Kindle Fire HD. Clear All Cookie Data: You can tap this setting, and then in the Clear dialog box that appears, tap OK to clear all cookies from your device. Clear Cache: Any computing device holds information in its cache to help it redisplay a page you’ve visited recently, for example. To clear out that cache, which can also free up some memory on your Kindle Fire HD, tap OK.
Clear History: Your Silk browser retains a history of your browsing activity to make it easy for you to revisit a site. However, it’s possible for others who view your browsing history to draw conclusions about your online habits. To clear your history, tap OK in this setting. Remember Form Data: If you want Silk to remember data you’ve entered into forms before — such as your name, mailing address, or e-mail address — to help you complete online fields more quickly, tap this check box. The danger here, and the reason you might choose to deselect this check box, is that if somebody gets a hold of your Kindle Fire HD, they could use this feature to gain access to some of your personal information or use your online accounts. Clear Form Data: Clears out any form data you’ve already saved. Remember Passwords. If you want Silk to remember passwords that you enter for various accounts, tap this check box. Just be aware that this setting puts your accounts at risk should you ever misplace your Kindle Fire. One option, if you use this setting, is to require a password to unlock your Kindle Fire Home screen. Clear Passwords: If you previously allowed Silk to remember passwords but have a change of heart, you can tap OK in this setting to remove saved passwords. Enable Location: Tap this check box to allow websites to request information about your physical location.